Welcome to the Bucharest 2010 weblog. This weblog is maintained during the official EPMagazine meeting at Bucharest during 18 till 23 January 2010. We hope you’ll enjoy this weblog. Read also Natalie Ross's story! and Vladimir Manea's letter! Today has been another crucial day. The Meeting has been hosted by Teoretical Liceul Ion barbu, as scheduled. After the exquisite hospitality of Tehnical Liceul Mihai bravu, we received a warm welcome by the headmistress, the school board and the students in the Physic Laboratory. Here we found the pupils ready and eagerly waiting to show the attendants their excellent skills in practice and theoretical Physic under the supervision of the Teachers Marcela Niculae, Elena Filip, Liliana Radu. Thus, they soon began to show their exhibits in various fields of this wonderful matter. After that, the Italian attending students gave them a few presentations about the activities they perform in the EPMagazine project and in order to let headmistress, teachers and students to realize the educative and didactic aims EPM tries to reach since more than eight years. After the exquisite lunch offered by a few very nice and kind teachers of the school, (without forgetting the lovely lunches given by Mihai Bravu last week), the teachers met with the headmistress of Ion Barbu Diana Ciulei, in order to talk about the application form for the common project to applying for a Comenius Multilateral Programme. The applicant full partners will be the following, at least: Boggio Lera, Ion Barbu, Denkoglu, Ahmet Eren, Hermes, Priestley College. Total: SIX Partners. Other applicants should be added if they are eligible for their Comenius National Agency. The following schools will be full partners even not applying: Mihai Bravu, Thessaloniki Experimental School. Other applicant Associated partners, both schools and universities institution, will be greatly welcome. This project will see the applicant and not applicant partners to work together on different ways: leading the students to performing researches, building up databases, organising student mobilities, and so on in the field of pollution, its remedy, green energies to avoid bad consequences to human mankind. What is possible to say after hearing the daily reports from Bucharest? I am sure everybody could track the conclusion and get up an autonomic decision: enter or not in such a challenge? The day has been open by Razvan Stoica and Mihai Dima, National College Ion Creanga, Bucharest, that talked about their school, giving a useful presentation. they will participate for a separated award which price will be a ticket to the next EPMeeting and accommodation in a family. The ticket (paid sharing the cost among the partners) will be given to one winner, even if the article will be written by two or more students. Claudio closed the day showing the attendants the list of activities to be develop during this year describing each one and asking everybody to be prepared to accept one or more activities as full partner or cooperating one (As explained by Claudio in his presentation). The day and the Meeting are informally closed for now at the Technical College Mihai Bravu in Bucharest. Tomorrow the official end of works will take place at Ion Barbu High School in Bucharest. Crina Stefureac, that mainly worked to get this meeting successful, underline an almost large participation of Romanian Institutions (seven high schools and three universities), mainly interested in the active partnerships or in a concrete cooperation with the project. The day has been open by Anamaria Liceo Boggio Lera, Catania, Italy, that gave a talk about How to use EPMagazine in class, in order to suggest different kinds of using such a tool during the curricular teaching. Luca Guarrera, Liceo Boggio Lera, Catania, Italy, followed with his ideas and technical proposals in order to improving the shape and technical strategies of managing the EPM Web site. Furthermore, Mattia Masciarelli, Liceo Boggio Lera, Catania, Italy, introduce his proposed layout for the 2010 EPM issues. Just after Mattia, Claudio talk about the revaluation of the Layout used in 2008 with a few minor modifications. Thus it is required to choose among the two propositions and after the ballots, the accepted layout for the 2010 is the Mattia’s one. Close the day Natalie Ross, Catholic university, Australia, with her highlighting the strict interactions among Philosophy, Science and History of Science. To be noted the participation, for a couple of presentations, of the Deputy School Inspector Prof. Cristiana Mateiciuc for the School Inspectorate of Bucharest. She appreciated a lot the active role of the students during the meeting. See you all tomorrow, with another important session. 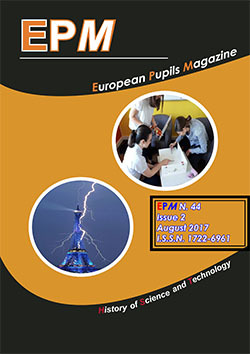 EPMagazine offers universities and schools a collaborative literary space for the sharing of scientific ideas and discoveries in their historical and cultural context. What better way for young thinkers to develop their communication skills in the sciences, across international borders using English as a common language whilst incorporating first language contributions into the layout. The European Editorial Board supports scholars of the sciences as they develop their written and spoken English language skills... Read the whole text! Today has been a very crucial one, with the Italian Editorial Board explaining the new partners the basis of the whole project from the beginning to the future, with the enlargement of the EPM aims to schools and Universities located worldwide in the world (the same challenge launched at Budapest during last International Meeting of the History and Philosophy of Science and Technology in July-August 2009). During the presentation of the university students yesterday, everybody agreed they need the same educational skills the school pupils require. Anamaria Grofu & Carola Mingrone, Liceo Boggio Lera, Catania, Italy, showed the results of the last EPM Surveys 2009 and gave the results of a short survey launched yesterday by Claudio: Do you believe EPMagazine could be useful for educational and didactic use at University world? Do you wish EPM partnerships be enlarged to teachers and students of higher Institutions? The answers were unanimously YES. Thus, Anamaria & Carola launched another challenge: enlarging the EPMagazine Sections with a University one: are those students admitted to yearly EPM Award? And, if the answer would be yes, are they admitted to the competition together with the school students or it could be better to provide a second, more appropriate, Award for them? Let’s eagerly await tomorrow to have the results of this last survey. Claudio Arena, Liceo Boggio Lera, Catania, Italy, closed the work day with a crucial: What kind of activities are normally shared among the partners. This presentation is highly clarifying the partner activities, thus, consequentially, each participant is conscious of what it is called to do and why. The meeting will take place tomorrow would see the official ad-hesion or not of the attending Institution to the new (definitely enlarged?) partnership. Arrival of participants to the hosting school. Brief welcome by Crina Stefureac in the name of the whole School Board. The group of participants enjoyed the visit of the school (classes, labs, and so on). The meeting went on with other interesting scientific presentations given by other universities students, with interesting new, even not confirmed, theories. The end of the day has seen Claudio Arena (Liceo Boggio Lera, Catania, Italy) giving a talk about the Use of EPMagazine as educational and didactic tool at the scientific and linguistic university faculties.